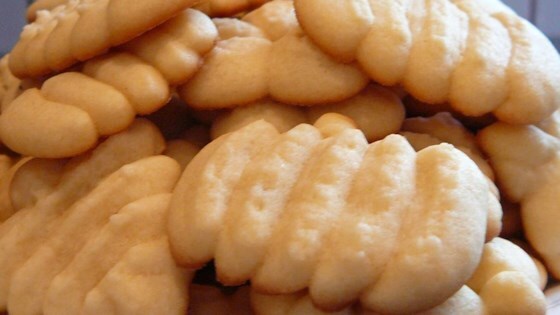 "This is a simple butter cookie that can be used in a cookie press, as a drop cookie or made into a roll and sliced. There is no mystery cookie for a cookie press...any stiff butter type can be used. Just be sure to chill it thoroughly so it keeps its shape while baking." Not at all what I expected, I'm from Chicago and I was really looking for those rich, finger printed, lunch room cookies! so if any one has that recipie please share. I was hoping for a Christmas tin butter cookie and these werent close, in my opinion, at all. I was highly disappointed.